Includes 2 hour private yacht rental for the selected cruise, round-trip hotel transfers, complimentary tea & coffee on-board, crew, fuel and all taxes. Optional extras: Dinner and other enhancements available. Our special program includes: 3 hours private yacht rental for your Christmas Day Private Bosphorus Cruise, complimentary round-trip hotel transfers by private vehicle between your centrally-located hotel and our dedicated pier, crew, fuel and all taxes. Optional - Lunch & Drinks Package: 59€ Euro per adult / 30€ Euro per child. Our special program includes: 4 hours private yacht rental for your Christmas Day Private Bosphorus Cruise, complimentary round-trip hotel transfers by private vehicle between your centrally-located hotel and our dedicated pier, crew, fuel and all taxes. Optional - Dinner & Drinks Package: 89€ Euro per adult / 45€ Euro per child. 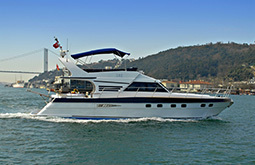 2 hour Bosphorus cruise followed by a 6 hour Princes Islands cruise. Includes 8 hour private yacht rental for the selected cruise, round-trip hotel transfers, complimentary tea & coffee on-board, crew, fuel and all taxes.